For example, take a look at the picture to the right and tell me whether the mushrooms, with white stuff hanging from the cap margins, have partial veils or not. Sure they do. But wait; here come the mycologists, who point out that the white roll of tissue doesn't ever touch the stem, even in the button stage. No, it's a "false veil," though you would never know it if you hadn't picked it when it was about the size of a mouse's nose. As if the "false veil" nonsense weren't enough, Suillus neoalbidipes can't decide whether it has glandular dots or not. Or, better said, whether it feels like showing its glandular dots, since they are always present, but are often tiny and colored like the stem, especially when the mushroom is young. To be sure that the illustrated mushrooms had glandular dots, I had to dry the mushrooms (the dots become brownish on drying), and confirm their presence by examining the stem surface with a microscope. Glandular dots are the result of little clusters of "caulocystidia," which are inflated cells that stick up higher than the others. 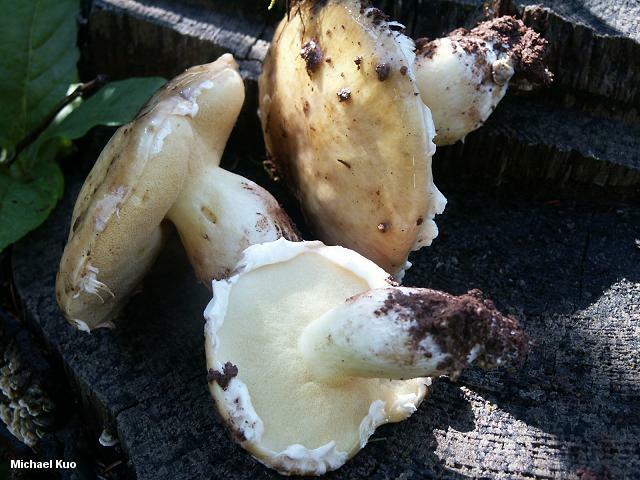 Distinguishing features for Suillus neoalbidipes, then, include the roll of white tissue on the cap margin; the yellowish cap and pore surface; and the whitish stem that develops brownish to reddish brown stains and does not demonstrate its glandular dots until maturity (or when dried). Suillus albidipes, in the sense of most authors, is a synonym. However, Palm & Stewart (1984) examined the type collection for this taxon and found it to be Suillus granulatus. Since the mushroom that most authors have in mind when describing "Suillus albidipes" is not Suillus granulatus, Palm & Stewart proposed the name neoalbidipes, selecting an Alexander Smith collection from Michigan as the type. Ecology: Mycorrhizal with various pines; growing alone or gregariously; summer fall; northeastern and northern North America, and the Pacific Northwest. I collected the illustrated specimens at high elevation in Colorado. Cap: 4-10 cm; convex becoming broadly convex; slimy; smooth or with tiny fibers at maturity; yellowish, usually darkening somewhat with age; with a conspicuous white roll of tissue (a "false veil") on the margin. Pore Surface: Yellow; not bruising; pores more or less round, 2-3/mm; tubes to 1 cm deep. Stem: 3-6 cm long; .5-1.5 cm thick; more or less equal; whitish to pale yellowish, often becoming bright yellow near the apex; surface without glandular dots at first (or with pale, tiny dots that are not noticeable), later with brownish glandular dots; developing brownish to reddish brown stains, especially near the base; without a ring. Flesh: Whitish to yellowish; not staining on exposure; sometimes light greenish above the tubes when young. Chemical Reactions: Cap surface grayish to purplish with ammonia; greenish gray with KOH; pale olive with iron salts. Flesh pinkish to lilac with ammonia or KOH; grayish or bluish with iron salts. Spore Print: Brown to yellowish brown. Microscopic Features: Spores 6-10 x 2-3 µ; smooth; subfusoid. Pleurocystidia rare; clavate; 20-45 x 5-10 µ; often with pigment granules. Caulocystidia in bundles; cylindrical or clavate; 20-80 x 4-11 µ; with pigment granules. REFERENCES: Palm & Stewart, 1984. (Singer, 1945; Smith & Thiers, 1964; Smith & Thiers, 1971; Thiers, 1975; Grund & Harrison, 1976; Smith, Smith & Weber, 1981; Palm & Stewart, 1984; Both, 1993; Bessette, Roody & Bessette, 2000.) Herb. Kuo 08140303.